It’s an odd time for the old greenhouse right now. Although it’s dipping down nightly to near freezing outside (and thus about 45* inside) it is still awfully warm in there during the day. The other greenhouse, the one without the plastic on it yet (grumble grumble that’s what we’re doing Saturday so help me) is filled with growing lettuces: they like it cool. They even like frost. If I had transplanted them into the old greenhouse, they’d shoot into flower, it’s still so hot in there during the day. SO it’s too warm for big seedlings. I also think it’s too warm for seeds, though I will be making a first planting of arugula and minutina (a type of plantain) this weekend. I will wait a couple more weeks yet until I do more seeds, mostly of lettuce and spinach. What have I done in there then? Well, the peppers are still happy. The pumpkins are slowly ripening to orange. And I have done my first plantings of the allium family. I divided one large clump of bunching onions (scallions) to a new area. 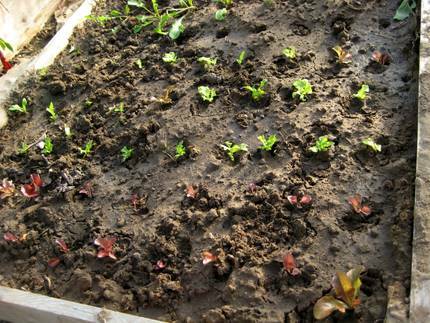 I also sowed a bunch of little sets of the Egyptian walking onions. I even planted some leek bulbs. What the heck are leek bulbs? Well, if you overwinter leeks, they’ll produce flowers for you the next year…a good thing for seed-savers like me. 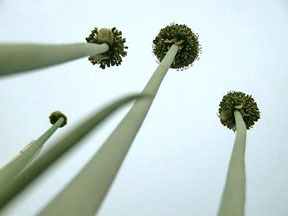 If you allow the plant to stay there after harvesting the flower, it will often do two things to hopefully extend its life: it might produce leek pearls (little leeks growing right off the main leek) or leek bulbs. Elephant garlic is actually a type of leek that’s prone to bulbing. Anyway, when I harvested my seed stock leeks, I found quite a few bulbs and a few more pearls attached to the dying parent plants. I planted the pearls and saved the bulbs until now. But I am still casting about to find some things to plant in the garden that are not seeds. Lazy gardening has come in handy once again! 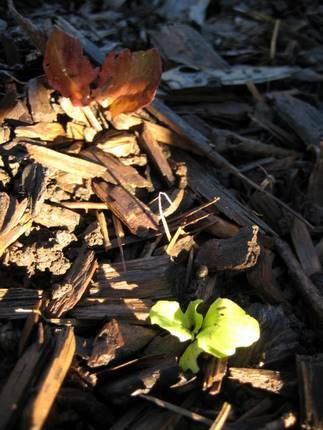 The kid and I found some lettuce babies growing in the path next to the lettuces I had allowed to go to seed. The babies are tiny (under 2″) but she and I slowly uprooted them Wednesday and transfered them to a waiting garden bed. Oooh…I had no idea leeks would do that. Sounds great since I always have terrible trouble growing leeks from seed. I’m going to try again next year, of course, and I’ll leave a few in the ground to see if they bulb. I’m lousy at growing leeks too but I’ll try again next year. I’m curious…do you keep any of the apples/pears in storage or do you put them up in some form or another? Taylor, yeah, leeks can be kind of tricky…I tend to oversow to kind of hedge my bets. One of the leeks was on its 3rd season; this little guy produced all kinds of pearls and a good 3 bulbs! The others were just 2nd season ones. I just find it fun how much my tightwaddery and laziness are paying off. Hey Kathy. I also store about a bushel or two of apples, usually the storage types, but…I am really not sure what kinds of apples mine are (storage or not) so we’ll just have to see how they do in the root cellar. But yeah, I have about 3 bushels of apples now that will be turned into sauce and the like. Yep. That’s a lot of apples but…applesauce cake is mighty yummy! We tend to go through about 25 quarts of the stuff. How’d those leek bulblets work out for you? I have clumps of leeks and I’m breaking the biggest ones off to eat and will plant the others in leek-like fashion in trenches. A lot of work. Does it work? I’m happy if they just make flowers. I ran across your blog today when seeking “planting leeks from bulbs.” glad I did. Looks like we have a few things in common.